When you send flowers to Russia with daFlores, you're sending the best of the best. Our gorgeous bouquets are ideal for all occasions, from simple pick-me-ups to a full romantic proposal. No matter what your needs, with our wide network of expert florists in Russia, daFlores has the knowledge you need. Russia has different meanings to different people, and used to be the generic term for the USSR. But that republic has gone now, split into dozens of different countries, and the Russian Federation lies at its heart with Moscow its most well-known city. DaFlores works in Russia like it does in other countries; we carefully vet and interview the best florists in Russia. 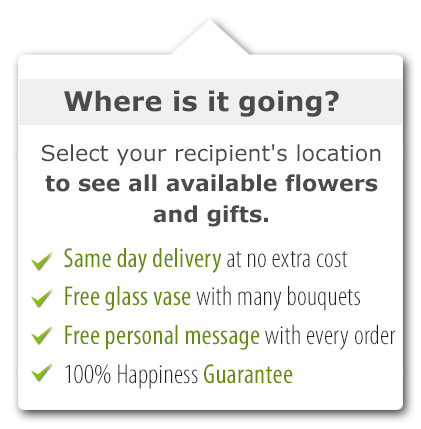 When we're satisfied, we set up a partnership in major cities so you can send flowers to Russia. From St. Petersburg to Moscow, Yekaterinburg and beyond, daFlores can arrange flower delivery in Russia. An incredibly diverse country, over 100 languages and 160 ethnic groups are alive and well in Russia. That diversity might be said to symbolize Russia's flora and fauna; this is a big country whatever way you look at it, with lots of different habitats. Our florists in Russia are well aware of such cultural traditions, and are proud of what they do. Traditional cuisine here makes good use of fresh ingredients: Barley, rye, wheat, fish, honey and berries are all common. We too have something sweet in Russia -- our romantic roses also come in a range of colors so you can use them for different types of flower delivery in Russia. And that's just the beginning of your choices when you send flowers to Russia. 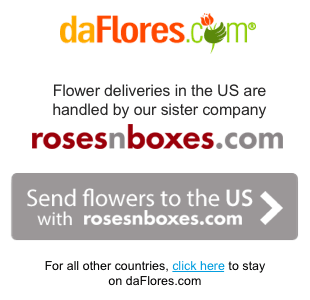 It's easy to send flowers to Russia with daFlores. You can shop in English or Russian, for a start, and our site is divided into sections like mixed bouquets to help you find what you need. Our customer service team can help you both online and offline, too. Our growers in Russia don't need to climb the Urals or Carpathians in search of blossoms for your stunning flower delivery in Russia. Our suppliers use professional growers to fulfill the promise that the flowers you send in Russia will last at least a week. We're proud to work in Russia because it's such an amazing country. Striving to reinvent itself, the country has produced scientists, artists, great authors and more. We work only with florists in Russia who've been business a decade or more, ensuring that each gives you personal attention and brings in fresh flowers every morning. 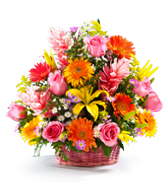 As always, when you send flowers to Ecuador, Russia or any other country, daFlores guarantees 100 percent satisfaction. If you're not over the moon with what our florists in Russia produce, you just let us know and we'll make it right. But we're confident that, thanks to our careful quality control and years of experience, when you arrange flower delivery in Russia, these will be the best bouquets your loved ones have ever seen. Same Day Flower Delivery to all cities in Russia. Para ver esta página en Español, favor visitar nuestra página de Enviar Flores a Rusia.